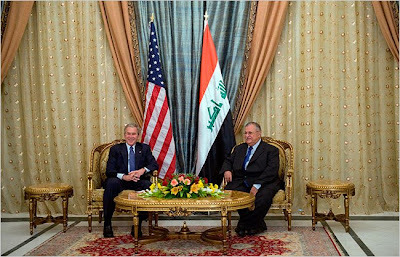 George W. Bush on his last surprise visit to Iraq. One million summary reports can't be wrong. No matter what the topic or issue, it seems any analysis of the George W. Bush administration conjures up words like "QUAGMIRE, or "FIASCO," or "BLUNDER," or "FAILURE." And regarding Iraq, these words have almost lost meaning from overuse. But, here is yet another report. This one using the same words, but discussing a slightly different subject: the rebuilding of Iraq. In 2002, Colin Powell famously told President Bush about the "Pottery Barn Rule." According to Bob Woodward in Plan of Attack, Powell said to Bush, "'You are going to be the proud owner of 25 million people,' he told the president. 'You will own all their hopes, aspirations, and problems. You'll own it all.' Privately, Powell and Deputy Secretary of State Richard Armitage called this the 'Pottery Barn rule:' You break it, you own it." And W. broke it, indeed. Like Humpty Dumpty. Certainly by now you can guess the rest. With George W. Bush at the helm, the U.S. tries to rebuild Iraq during a monumentally mismanaged post-war occupation. You can just hear the words start flying... "failure," "corruption," "crippled," "ignorance," "haphazard planning," "disjointed prewar planning," "botched..."
The Iraq rebuilding fiasco is now a $100 billion failure. This is the legacy of George W. Bush. "HARD LESSONS: The Iraq Reconstruction Experience"